Special Experience: a classic itinerary of Hutong tour, visiting local Hutong family and beautiful landscapes. Be met our private English-speaking tour guide at the check point at Shichahai area. First, climb the 700 year old Drum Tower and enjoy the fantastic panoramic view of the ancient city; in addition you may watch a drum beating performance. Then you are going to walk along the ancient Yandaixiejie Street for a look and study some folk custom there. Standing on the Wan’ning Bridge, which is the oldest bridge in this area, you may look at the Fire God Temple with a history of over 1,300 years. Afterwards, let’s go to the Silver Ingot Bridge (Yindingqiao) to enjoy the beautiful scenery of West Mountains. Lunch time comes at noon and you will enjoy home cooking at a local hutong family, learning to make dumplings. After lunch, be guided along the narrow ancient Hutongs, where to appreciate the Hutong culture, the gate buildings and the courtyards. In the afternoon, visit the Guanghua Temple and the former residence of Madam Song Qingling who is a legendary female in China, the wife of Sun Yat-sen and the only honorary president in the PRC. Snacks at the Nine Gates Snacks will make your mouth water. Along the bank of lake, see the Wild Duck Island which is the paradise of the wild ducks and birds. Prince Gong’s Mansion is a highlight during the tour, where you may be well informed of the aristocratic culture in the Qing Dynasty. Finally, come to the reputed Shichahai bar street. 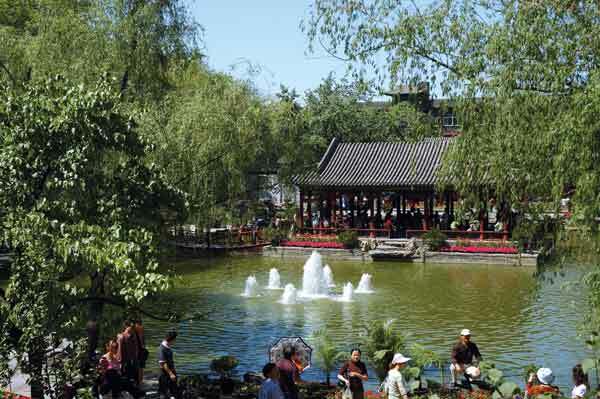 Characteristic bars are well integrated into the old city area together with the natural lake scenery. 1. Romantic lake cruise. At the nightfall when all the neon lamps are brightened, flows slowly by the boat on the lake, lotus blooming, the lute playing out beautiful music, all of which trace you to the free time of imperial youngsters. 2. Make your accommodations in the courtyard house of local Hutong family instead of a hotel. Taste the authentic Beijing home cooking, have a stroll in the Hutongs, becoming a Beijinger by integrating in their life.